Green Tea, rich in antioxidants, increases metabolism and helps burn fat. Lose Weight With Green Tea provides all the information you need to incorporate Green Tea safely and sensibly into a successful weight control program. A Delicious Organic Green Tea! Summary : This tea is exactly what you would expect from a Organic Gunpowder Green Tea. This tea from the Dragonwater Tea Company (now out of business) has no bitterness, has a very smooth and mellow flavor and looks exactly what a gunpowder green tea should look like. Review : I love green tea. Which is why I found it odd, looking over my latest tea reviews, that I hadn't had any green tea in over a week! I'd been sampling all sorts of chai teas, herbal teas and some black teas. So it seemed I completely forgot about green tea. And so, to rectify that situation, I pulled out a gunpowder green tea sampler I purchased from the Dragonwater Tea Company (now out of business). For those not familiar with it, gunpowder green tea are leaves that are tightly rolled into pellets. If you are interested, follow this link to learn more about the different types of green tea. Here is how the Dragonwater Tea Company (now out of business) describes this tea : "Dragonwell (Organic) Tea. This entirely handmade, organic, superior-grade green tea is the most famous of China's Fifty Famous Teas. Produced in the small Chinese village of Lung Ching (Dragon Well) west of the famous West Lake in Zhejiang province, this tea is known for its "four uniques": its green color, mellow taste, aroma, and beautiful shape. USDA organic." This tea contains only one ingredient : Organic special grade Chinese green tea leaves that are rolled into pellets. Like other "pure" green teas, or those that do not have anything added to them...the aroma of this tea was as expected. The tea had a weak fragrance that smelled exactly like what a gunpowder green tea should. Similarily, the flavor of this tea matched the aroma, being exactly what I've come to expect from other gunpowder green teas. The flavor was very light, very smooth and had no bitterness at all. Obviously, being a green tea...be sure to not overbrew it otherwise you will discover some bitterness. Overall, this is a top-notch gunpowder green tea. Green tea purists will simply enjoy this tea immensely. So if you enjoy quality, organic green teas...head on over to the Dragonwater Tea Company (now out of business) to give this tea a try. Recommendation : Yes. This is a excellent organic gunpowder green tea, with no hidden nasty surprises. Green tea purists, or anyone else or enjoys the light and subtle flavor of a green tea, will almost certainly enjoy this tea. Brewing Instructions : Use .5 teaspoon of tea leaves per cup. Pour water with a temperature of 180 degrees over leaves. Let brew for 2 minutes. 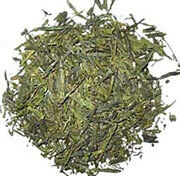 Adagio Spiced Green Tea : A very enjoyable and tasty green tea. Lipton 100% Natural Green Tea : Your typically bad chinese restaurant green tea. Stash Jasmine Blossom Green Tea : An excellent jasmine tea, much to my surprise. The tea really packs a delightfully strong jasmine flavor and fragrance. Celestial Seasonings Decaf Mandarin Orange Green Tea : A very tasty decaffeinated green tea with an excellent orange flavor.